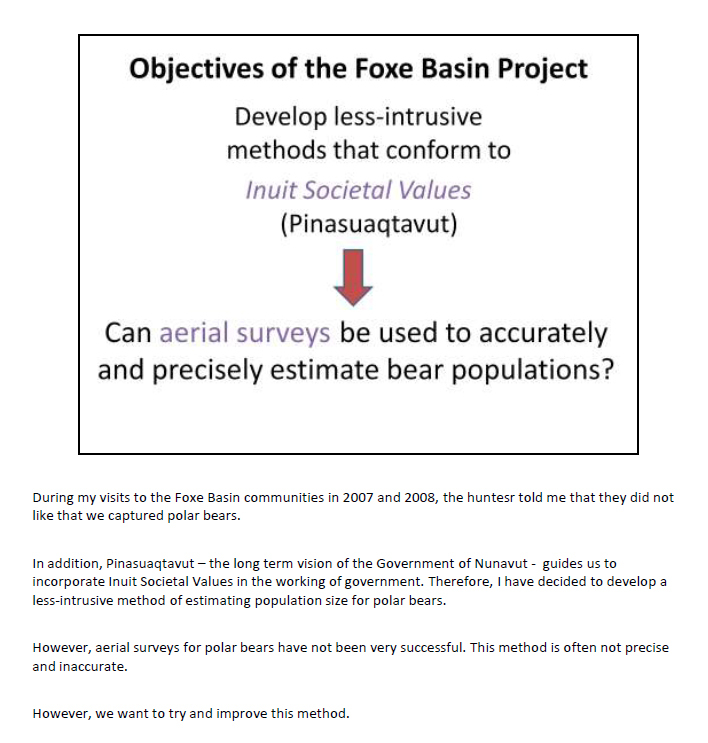 As I outlined earlier this week, Canadian Inuit objected so strenuously to routine mark-recapture methods used by polar bear biologists during the early days of a Foxe Basin population study in 2008 that the work was abandoned and an aerial survey done instead. In this post, I’ll examine how the polar bear biologists involved reacted to that crisis, which they called a “control of research” issue. They raised an interesting point – since the Government of Nunavut has the power to insist biologists do more than reiterate that their way of counting bears is the only acceptable way, and because the government can deny permits to projects that don’t measure up, it can lock out traditional polar bear research for virtually all of Canada (the vast majority of Canada’s 13 subpopulations are in Nunavut, see Fig. 1), especially since aboriginal organizations in the Northwest Territories and Quebec have followed Nunavut’s lead. Figure 1. 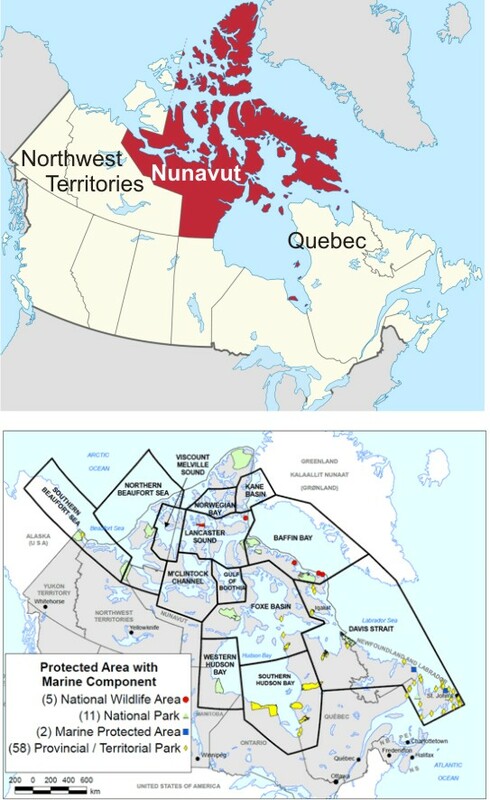 Territory covered by the Government of Nunavut (top, Wikipedia) and the 13 polar bear subpopulations in Canada (bottom, Environment Canada). That means if polar bear researchers can’t find a way to make their research mesh with Inuit concerns, they’ll be out of work in Canada. Let’s take a look at their approach and see how well it worked for them — explaining in part the new prominence of aerial surveys for population assessments. A rather clear expression of the frustration felt by the biologists involved in the Foxe Basin research comes across in a presentation given by Lily Peacock in 2009 at a Wildlife Research meeting in Rankin Inlet, Nunavut (Peacock et a. 2009, pdf here). By this time, the permit for field work that year had been denied and an aerial survey to replace it had begun. It’s clear to me Peacock certainly tried to address Inuit concerns in a respectful way but I don’t know that she really hit the mark with her audience. Personally, I thought it was rather patronizing. She insisted that while she understood the community had objections, this was simply how the work had to be done regardless of what they thought. She then tried to plead that mark-recapture needed to be done along with aerial surveys to validate its accuracy, despite their objections. Have a look at a few of her slides below (Fig. 3-5), paying attention to the fine print – those appear to be her speaking notes. I’ve transcribed the first one because it is impossibly small. Figure 3. Lily Peacock and colleagues explain their proposed mark-recapture polar bear work at a Wildlife Research meeting in Rankin Inlet, Nunavut (Peacock et al. 2009). This is slide 17. Peacock’s speakers notes, in tiny print below the slide, are transcribed below. “We understand that there is discomfort among Inuit that we handle animals. We have heard this at our community meetings. However, mark-recapture gives us the most accurate and precise information. The better the information – the more confidence in defending harvest rates. We take great strides to decrease handling in Nunavut. Figure 4. Peacock et al. 2009, slide 20. The notes below the box are her speakers notes. Figure 5. Peacock et al. 2009, slide 21. The notes below the box are her speakers notes. 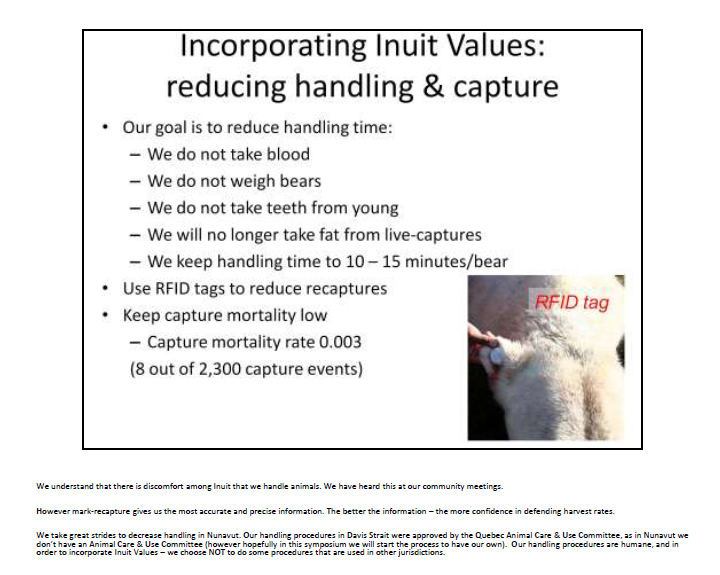 I noticed that nowhere in her presentation was there a promised not to do two of the things that strike me (and perhaps Inuit also) as particularly disrespectful, evidenced by the two photos below: taking advantage of a bear’s tranquilized state to use it, or its cubs, as “photo ops” that would not be possible with a conscious bear. Biologists allowed Geoff Haskett, Regional Director of the Alaska Region of US Fish & Wildlife Service (an administrator, not a biologist), to use this tranquilized bear as a photo op. From his US Fish & Wildlife “about” page. 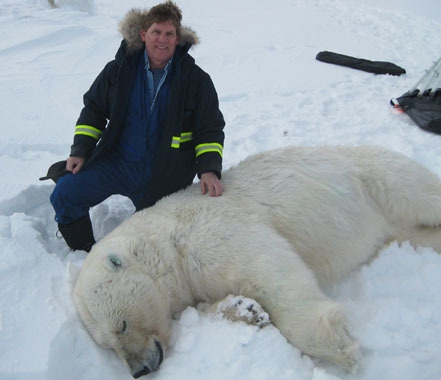 Conflict in perspectives of how research is conducted on polar bears and how the results are applied to management has become a conservation concern. Here we review the harvest of polar bears in Baffin Bay, a subpopulation shared between Canada and Greenland, as a case study that elucidates the roles of multiple stakeholders and exemplifies current controversies. Although a population inventory for Baffin Bay was completed in 1997, a report was not published in the peer-reviewed literature until 2005 (Taylor et al. 2005). This report, which provided a population estimate of 2074 ± 266 (mean ± SE) bears with an annual sustainable harvest of 88 bears, was followed by extensive public consultations regarding harvest levels. In 2005, polar bear harvest was increased in Nunavut from 64 to 105 bears/year (Stirling and Parkinson 2006), based on survival and recruitment data (Taylor et al. 2005) and assumptions of a low harvest in Greenland. It was soon clarified that the annual harvest in Greenland, where no quotas had been in effect, was much higher than previously recognized. Consequently, the Baffin Bay subpopulation was determined to be declining (IUCN/SSC PBSG 2006), and in 2006, Greenland responded by introducing a quota system and reducing harvests (IUCN/SSC PBSG Resolution 2009; available from http://pbsg.npolar.no/en/meetings/, accessed 16 June 2010). During a second round of community consultations in Nunavut in 2008, data and scientific simulations suggesting the Baffin Bay subpopulation was in decline were considered by local groups and the co-management board as being too old to be used in decision making (NWMB 2008), even though the study was highly quantitative and the trend was supported by evidence of declining sea-ice habitat (Stirling and Parkinson 2006) and declines in body condition of polar bears (Government of Nunavut, unpublished data). The biologists might be right about that final sentence, but whose fault is it? They imply the Government of Nunavut made bad decisions in the Baffin Bay case and that scientists were proven right because Nunavut reduced the quota in response to bullying by the international community, not because there had been a demonstrated reduction in the population size caused by overhunting. To me, this approach smacks of lip-service to the concept of “co-management.” The biologists really just want to do things their way. They want the last word — which means ultimate control. There is some of that in the Inuit position as well. It’s a tricky situation, to be sure. I am a zoologist and understand the desire of polar bear biologists to collect detailed information but their stance here seems unduly rigid and doomed to failure when Inuit are just as determined to gain back some of the control they’ve lost over previous decades. I don’t see it as being truly resolved anytime soon. Southern Hudson Bay aerial survey completed 2012 (Obbard et al. 2013) – Ontario/Quebec pfd here. We may have seen the end of polar bear mark-recapture studies in Canada but that doesn’t mean that population assessments aren’t being done. Aerial surveys seem to be the new standard, even outside of Nunavut. Obbard, M.E., Middel, K.R., Stapleton, S., Thibault, I., Brodeur, V. and Jutras, C. 2013. Estimating abundance of the Southern Hudson Bay polar bears subpopulation using aerial surveys, 2011 and 2012. Ontario Ministry of Natural Resources, Wildlife Research and Monitoring Section, Science and Research Branch, Wildlife Research Series 2013-01. Peterborough, Ontario. Pdf here. Peacock, L, Orlando, A. and Coxon, A. 2009. 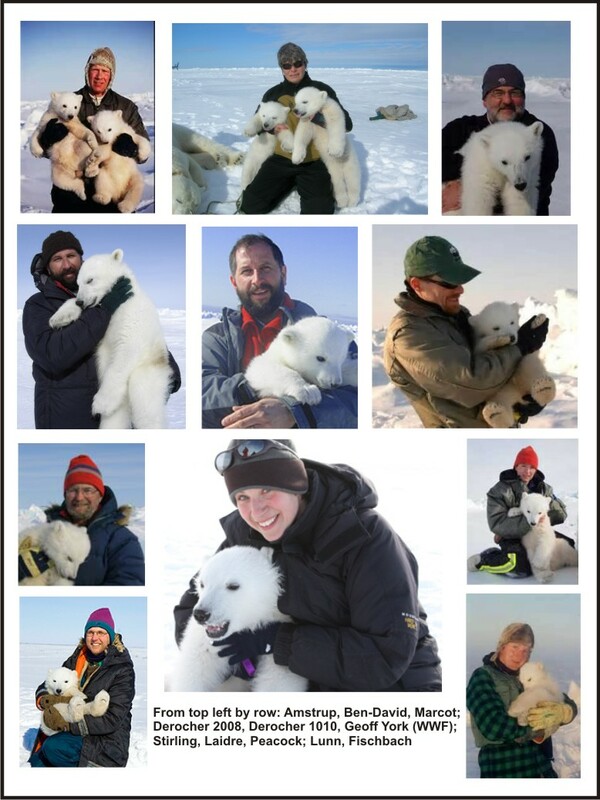 Polar bear monitoring and research in Nunavut. Presentation at Wildlife Research Symposium, Rankin Inlet, Nunavut. March 16-18, 2009. Pdf here. 1.This review is part of the virtual symposium “Flagship Species – Flagship Problems” that deals with ecology, biodiversity and management issues, and climate impacts on species at risk and of Canadian importance, including the polar bear (Ursus maritimus), Atlantic cod (Gadus morhua), Piping Plover (Charadrius melodus), and caribou (Rangifer tarandus). 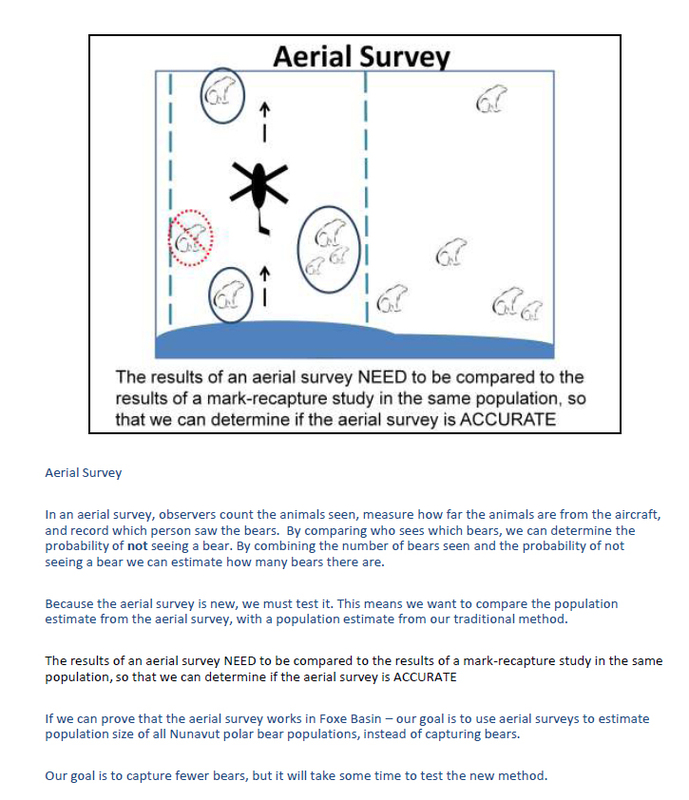 This entry was posted in Advocacy, Conservation Status, Population and tagged aerial survey, Derocher, disrespectful, Government of Nunavut, handling, Inuit, mark-recapture, Peacock, polar bear, population assessments, population surveys. Bookmark the permalink.